Led by SquadronCommander Roland “Bee” Beamont, Typhoons of 609 Squadron are dramatically illustrated as they scramble from their base at Manston in April 1943, the brute force and raw aggression of this tough warbird leaving nothing to the imagination. A collector’s piece for the future, of this there’s no doubt. A landmark aviation print edition for the purist collector-the very first to be published from the work of emerging aviation artist Richard Taylor. 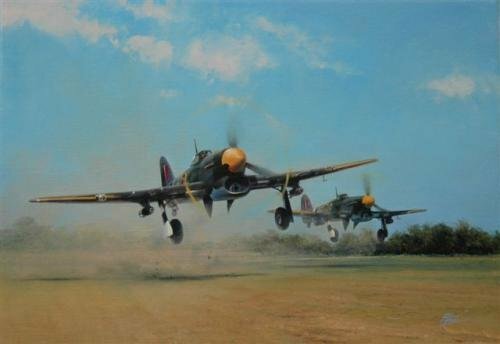 THE SIGNATURES Joining artist Richard Taylor in signing each print are three fighter pilots who flew the Typhoon in combat with 609 Squadron during World War II. Every print is hand- numbered.